“The grace and mercy of our good God and heavenly Father, and the love of His Son, our Saviour Jesus Christ, be with you, my dearly beloved. Now remember that I did not fall into the hands of my enemies by mere chance, but through the providence of my God who controls and governs all things, the least as well as the greatest. This is shown by the words of Christ, ‘Be not afraid. Your very hairs are numbered. Are not two sparrows sold for a farthing? And not one of them shall fall to the ground without the will of your Father. Then fear nothing. You are more excellent than many sparrows.’ These words of divine wisdom say that God knows the number of my hairs. How then can harm come to me without the command and providence of God? It could not happen, unless one should say that God is no longer God. This is why the Prophet says that there is no affliction in the city that the Lord has not willed. Many saintly persons who were before us consoled themselves in their afflictions and tribulations with this doctrine. Joseph, having been sold by his brothers and taken into Egypt, says, ‘You did a wicked deed, but God has turned it to your good. God sent me into Egypt before you for your profit.’ (Genesis 50). David also experienced this when Shimei cursed him. So too in the case of Job and many others. And that is why the Evangelists write so carefully of the sufferings and of the death of our Lord Jesus Christ, adding, ‘And this was done that that which was written of Him might be accomplished.’ The same should be said of all the members of Christ. It is very true that human reason rebels against this doctrine and resists it as much as possible and I have very strongly experienced this myself. When I was arrested, I would say to myself, ‘So many of us should not have traveled together. We were betrayed by this one or that one. We ought not to have been arrested.’ With such thoughts I became overwhelmed, until my spirits were raised by meditation on the providence of God. Then my heart began to feel a great repose. I began then to say, ‘My God, you have caused me to be born in the time you have ordained. During all the time of my life you have kept me and preserved me from great dangers and you have delivered me from them all – and if at present my hour has come in which I will pass from this life to you, may your will be done. I cannot escape from your hands. And if I could, I would not, since it is happiness for me to conform to your will.’ These thoughts made my heart cheerful again. I am practicing now what I have preached to others. And I must confess that when I preached I would speak about the things I am actually experiencing as a blind man speaks of colour. Since I was taken prisoner I have profited more and learned more than during all the rest of my life. I am in a very good school: the Holy Spirit inspires me continually and teaches me how to use the weapons in this combat. On the other side is Satan, the adversary of all children of God. He is like a boisterous, roaring lion. He constantly surrounds me and seeks to wound me. But he who has said, ‘Fear not, for I have overcome the world,’ makes me victorious. And already I see that the Lord puts Satan under my feet and I feel the power of God perfected in my weakness. Our Lord permits me on the one hand to feel my weakness and my smallness, that I am but a small vessel on the earth, very fragile, to the end that he would humble me, so that all the glory of the victory may be given to him. On the other hand, he fortifies me and consoles me in an unbelievable way. I have more comfort than the enemies of the gospel. I eat, drink and rest better than they do. I am held in a very strong prison, very bleak, obscure and dark. The prison is known by the obscure name ‘Brunain.’ The air is poor and it stinks. On my feet and hands I have irons, big and heavy. They are a continual hell, hollowing my limbs up to my poor bones. The chief constable comes to look at my irons two or three times a day, fearing that I will escape. There are three guards of forty men before the door of the prison. 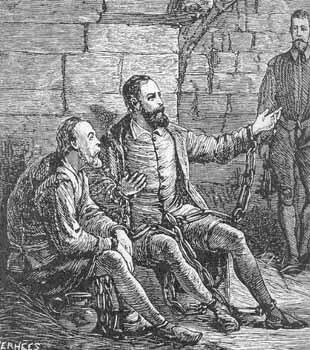 Guido de Brès was hung on 31 May 1567. He was pushed off the scaffold by the hangman whilst still addressing the crowd.